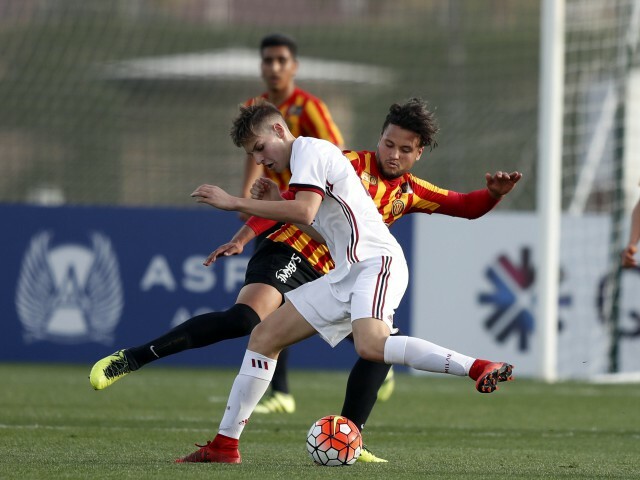 Esperance Tunis proved their convincing opening victory over Wydad was no fluke, dominating AC Milan and roaring to a 2-0 victory, in so doing preserving their proud record of not conceding at Al Kass 2018. Regardless of the result, both sides were already assured of qualification for the knockout stage. This knowledge seemed to contribute to a rather low-key opening, with little of the urgency that had characterised each team’s match-up against Wydad on display. Neither Milan nor Tunis had conceded a goal in their opening games, and their backlines were not unduly tested in the opening quarter this time round, with little to choose between the teams and few clear-cut chances. But all that changed on the half hour mark, as Tunis began to enjoy a sustained spell of pressure, culminating in the opening goal. Milan keeper Niccolo Zanellato saved a close-range effort and saw the rebound headed onto the bar, only for the ball to cannon into the path of Zied Berrima, who stroked home effortlessly. Roared on by a vociferous support, Esperance were now firmly in the ascendancy, snapping into tackles and generally disrupting Milan’s rhythm. The Italian bench erupted in protest against some rough treatment handed out by the Tunis side, but Milan could not find a way to fashion an equaliser before the half time whistle sounded. Tunis were straight out of the blocks as soon as the second half got underway, and doubled their advantage almost immediately. A powerful cross was swung in from the left, and Hamza Abdelkarim volleyed a first time effort home. On 50 minutes, two goals almost became three as midfielder Khalil Melliti burst into the area and shot hard and low into the right corner, but keeper Zanellato produced a brilliant reflex save to keep the ball out. Milan coach Simone Baldo had seen enough and, in an effort to introduce some attacking momentum, made a triple change. Alessandro Sala, Riccardo Tonin and Daniel Maldini replacing Niccolo Corti, Marco Frigerio and Andrea Porrini. With 15 minutes remaining, Milan almost found a way back into the game when Fantaziu Corneliu stole in at the far post, but shot over with the goal at his mercy. The chance exemplified the Italians’ day, with hope replaced by disappointment. On 80 minutes, flying winger Anice Ammous was centimetres away from adding a third for Tunis, after breaking free down the left and firing a low cross-shot that Zanellato somehow managed to tip round the post. It mattered little, as Milan were unable to muster a response, and ultimately came out second best. Tunis have the look of a side who are improving with every game and, with an aggregate tally of five goals scored and none against, will now believe they can go all the way. Milan, meanwhile, have plenty to do if they are to advance beyond the next round.